Size: 15" x 11" x 5"
- It provides superior safety to your electronics and pays you a major compliment all day long. Leben Tree 15.6 inch Sleeve/Slip Case (Red) Price: Rs. 599Light weighted Bag for laptops and documents.With shoulder strap. Keeping track with latest market development, we are devotedly engaged in manufacturing a wide assortment of Laptop Bag. We are manufacturer of all kind of bags and leather accessories. 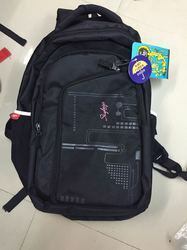 Customized black colour laptop bag.